We provide a full PA system and stage lighting for every booking. You are welcome to use our mic for speeches and you can also hire the PA for your afterparty/disco – just supply an iPod or similar! This is much more cost effective than hiring a separate PA or DJ! A céilí can bring a traditional touch to your wedding and it's the perfect way for two families to meet! Suitable for all ages, everybody can have a great time on the dancefloor! Perhaps you have some Scottish family? Let us know and we'll gear our dances to the tartan end of the spectrum! Many couples like to have us play a romantic waltz for their first dance so that everyone can join them, but we're equally happy to play a track of your choice through our PA. Whether you're celebrating a birthday / anniversary or just fancy a knees-up, a céilí is ideal for every occasion! We tailor our dances carefully so as to make sure everybody has a great time, as there will always be a mix of ages and abilities. We recommend 2 x 45 minute sets as people usually need a break to get their breath back! – Live folk songs: we have several talented folk singers in the band, who can perform for you before the céilí or between dances! – iPod-DJ service: hire our PA system to use for your afterparty / disco! Just give us a playlist on an iPod or laptop!  – Bass/Bodhrán/other: the band plays with some of the top traditional musicians in the country; let us know if you want a specific line-up of instruments... If you've got a huge venue and hundreds of guests you might consider hiring a few more fiddle-players!